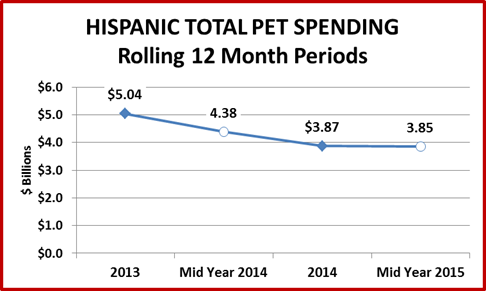 Cinco De Mayo seems like an appropriate time to do a brief update on Pet Spending by U.S. Hispanic Households. I wish there were better news to report but we’ll drill deeper to see what is causing this steep drop. The numbers in this report are computed from data in the Consumer Expenditure Survey conducted by the USBLS. Hispanic households are growing in number and influence in the U.S. They increased by 1,000,004 (6.3%) over the previous year, far exceeding the overall U.S. growth of 1.1%. As of 6/30/15 they numbered 16,910,000. That is 13.2% of all U.S. H/H’s. Additionally, while their H/H Income (79%) and Spending (85%) are below the U.S. average, both increased slightly faster than the average household. Financially, they are slowly gaining ground. 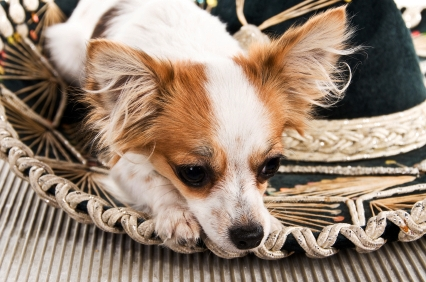 However, Hispanic H/H’s only spend 0.5% of their total expenditures on Pets, compared to the U.S. average of 0.9%. Now, let’s take a look at their recent history of Pet Spending. This chart should give an overview of Total Pet Spending since 2013. Remember , when making direct comparisons using a rolling chart, it is best to use similar time frames. Ex: 2014 vs 2013. Any way you look at it, a change of 1 year brought a big drop in spending. Let’s use the same type of chart to get an overview of the Hispanic spending in the individual industry segments. Pet Food – The dip in Mid 2014 mirrors what we saw in the overall Food market. However, the Total market made a big comeback in the second half of 2014 to end up 4.8% for the year. The Hispanic Market did not quite make it back to even. The Total Market saw explosive growth in Jan>June ending up 16.6% at mid-year 2015. The Hispanic Market was up, but only 6% and still below 2013 annual numbers. 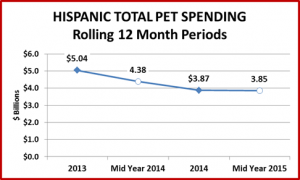 Veterinary – This is THE reason for the huge drop in Hispanic Pet Spending. Down to less than 1/3 of 2013 spending, the continued strong inflation rate in this segment seems to have had precipitous consequences in the Hispanic demographic. 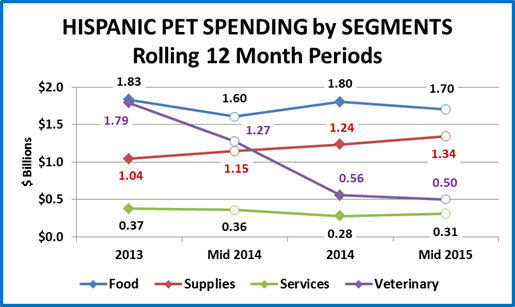 Services – A very small part of overall Hispanic Pet Spending, annually this segment continues to trend downward. Although Jan>June 2015 was up 30M from the same period in 2014. Supplies – This segment shows steady growth across all time periods, without the dip that we saw in the Jan>Jun 2015 numbers in the total market. 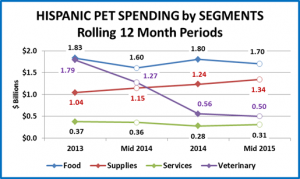 It’s possible that the spectacular drop in veterinary spending has helped fuel this increase as Hispanic Pet Parents turn more to OTC meds and treatments. Now let’s take a look at the Hispanic Spending in the Mid-Year Report by Industry segment. This chart compares the latest Mid-Year numbers versus the same period a year earlier. There may be other factors. However, the Service segments, especially veterinary, certainly appear to reflect the consequences of continued high inflation. The Supplies Segment is up $200M (17.1%) and is certainly the bright spot in the Hispanic Demographic. H/H spending on Supplies increased 10% and the number of H/H’s increased 6% to generate this increase. Food is still down from 2013 and 2014 year end numbers, but it is up slightly from the same period a year ago – $100M (6.0%). However, consider this. H/H spending on Pet Food was up 4.4% and the number of H/H’s was up 6.3%. If the percentage of Pet H/H’s remained the same and they spent 4.4% more per H/H then Pet Food Spending would be up 11%. Based upon this, the 6% increase in Pet Spending is basically little or no real progress. Let’s hope that the Veterinary spending trauma is over and that spending in all the segments turns up again. The Hispanic demographic is an important and growing segment in the overall U.S. market and should be for the Pet Industry too.